Jeremy Robins wants to use robots to bring disabled law enforcement officers back to the force. To bring his idea to life he’s so far given researchers at FIU’s Discovery Lab $20,000 of his own money and secured the loan of two custom-built robots from the Institute for Human and Machine Cognition (IHMC) valued at nearly $500,000. Robins, a lieutenant commander in the U.S. Navy Reserves, describes himself as someone from a service-oriented family who is “always looking for new challenges.” While serving in Afghanistan, Robins had an idea to help disabled police and military veterans reconnect with the work force while simultaneously combating crime. His idea is to use telerobotics, the combination of telepresence and robots, to allow disabled police and military vets to serve as patrol officers. According to the Veterans Administration, there are more than 181,000 Afghanistan and Iraq War veterans collecting disability benefits today. Many of these veterans are unemployed. In addition to military vets, thousands of police are forced to retire every year because of disability. Telebots could change all that. Thanks to Robins’ help, IHMC (a major grant-funded robotics institute headquartered in Pensacola, Florida) has agreed to loan FIU two robots built for its Urban Warrior Robot (UWR) program, a $2 million Defense Advanced Research Projects Agency (DARPA) initiative. 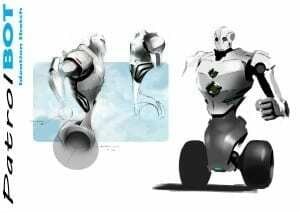 With the help of UWR project lead Jerry Pratt as well as the rest of the IHMC team, robots originally conceived for war will now be filling a whole new purpose in life fighting crime and keeping our communities safe. As exciting as FIU students now having two military-grade robots to work with is the idea that brought them here. After doing some initial research and learning more about FIU’s Discovery Lab, Robins, who has a degree in law but no background in engineering, put his idea in writing in an email to Professor Jong-Hoon Kim, director of the lab at FIU’s School of Computing & Information Sciences. The lab was created last spring and is aimed at developing products for the marketplace. Kim admits he was surprised to receive Robins’ email. It’s not everyday someone with no prior affiliation with the university offers to make a gift and presents you with a great idea of what to do with the money. Kim immediately shared the email with the school’s director, Professor S. Sitharama Iyengar, and Professor Nagarajan Prabakar. This, they all agreed, is just the sort of project the lab was interested in developing.